Perfectionism has stopped me in my tracks more times than I care to remember. I’ve had numerous brilliant ideas and exciting dreams that I’ve given up on before ever starting because I’m afraid of subpar results. This is a challenge that all INFJs wrestle with at some point. Your INFJ ability to see the future and vivid possibilities gets you all-kinds-of-excited about an idea, while your idealism weighs you down like an anchor, forbidding you to make a move. The predicament is that you’ll never be happy until you begin to take action and realize your dreams. If you’re tired of letting perfectionism hold you back from your potential, here are a few suggestions that may help you overcome your perfectionism and take more action. You are an introvert, and consequently, your natural focus is inward and on the world of thoughts and ideas. What’s more, you are a dreamer: coming up with clever new ideas is never a problem. Instead of beating yourself up when you’re struggling to take action, celebrate your creativity, innovation, and vision. You have an amazing gift. First, picture WHO you’ll be helping. Be specific. What’s her name? How will her life be different after you help her? Many INFJs are motivated to serve and help people. They love seeing others heal and grow and get excited about using their wisdom, insight, and problem-solving skills to this end. When I write, I sometimes visualize a friend or specific individual who’ll read my post. Thinking about the results he’ll get keeps me going. Along with who you’ll help, envision a better future. If you could design a life that suited your personality, what would it look like? Life – I want to control the when, where, and what of my work. Impact – I want to impact millions in areas that matter. Financial freedom – I want to write my own w-2. Effort – I want to live to my full potential. Take some time to think specifically about the future you want. Write it down. This should be fun for you as an INFJ. Mentors are people with permission to call you up and call you out. They call you up when they challenge you, and when they hold you accountable, they call you out. Mentors are people who’ve been where you want to go, so they can show you the best road to your desired destination. I wouldn’t have started this blog if it weren’t for my mentor. Though I’d thought about starting one before he said something, I needed his encouragement to get moving. When you get discouraged or depressed, you need support. That’s where cheerleaders come in. Family and friends make super cheerleaders. Their uplifting words will revive your spirits when you want to quit. I have a file full of kind words from friends and family that I pull out whenever I lose heart. It keeps me plugging along. You need to connect with people who are in your shoes too. You can go further together, swapping ideas and resources and checking in on each other’s progress. I meet with two friends once a month for about an hour. I’ve never left a meeting without at least one good idea to implement, and it’s nice to be able to share my ups and downs with people who understand what I’m going through. If you’re not doing something that scares you, you’re not pushing yourself enough. 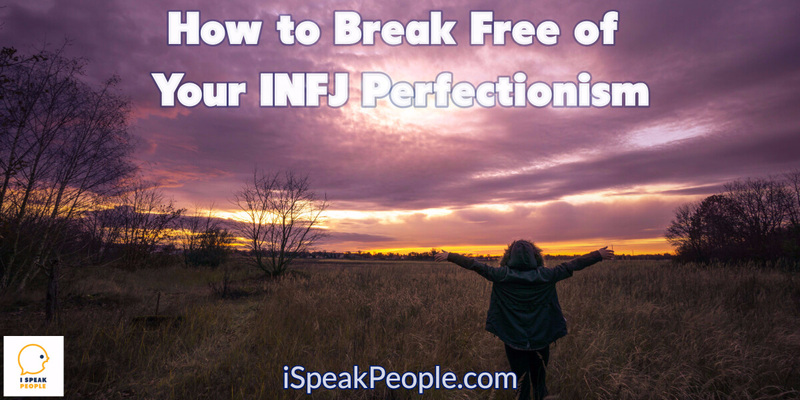 Before I published 73 Things I Wish You Knew About Me as an INFJ, I thought about deleting the post and writing something to replace it. Prior to that day, I had never been so vulnerable with my readers, and I feared what people would think. In the end, I published anyway. Boy, was I blown away by the response! That article is still by far the most popular one I’ve written thus far. That experience taught me the importance of taking risks and pushing myself. Each risk I take is making me more confident and helping me discover that people like the real me – not just the person I sometimes pretend to be. Where are the opinions of others holding you back? One of the most encouraging things I could ever tell you is that, as an INFJ, you have good taste. You have a high standard and are committed to quality. Unfortunately, your work may not yet be equal to your taste. You may not paint, write, or play as well as you want to. Your counseling or nursing skills may yet be lacking. Do yourself a favor, and take a moment to watch this video. It will encourage you.